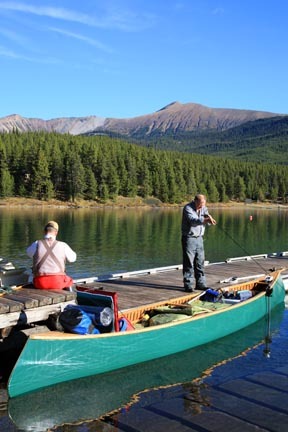 Since Curly Phillips built his boathouse in 1928, fishing has been one of the most popular pastimes at Maligne Lake. Although no species are native to the lake, brook trout (also called speckled trout or “brookies”) were introduced to Maligne Lake as a sport fish in 1928, with the government stocking program continuing through to the early 1970s. This colourful fish is easily identified by a dark green back with pale-coloured splotches and purple-sheened sides. In Maligne Lake, they average 0.7 to one kilogram (1.5 to 2.2 pounds), but the record for Maligne Lake stands at 5.8 kilograms (12lbs 8 oz). No one knows exactly how rainbow trout found their way to Maligne Lake, but it is be assumed they were introduced sometime before the 1960s. The rainbows in Maligne Lake average 1.4 to 2.3 kilograms (three to five pounds), although bigger fish are often reported. Preparing for a Maligne Lake fishing trip. Although stocking ended decades ago, Maligne Lake has self-sustaining populations of both species. Brook trout are a schooling fish that congregate around creek mouths or structures such as docks, while rainbow trout are solitary fish that are more evenly distributed throughout the lake. The predictable habitat of brook trout make them popular with some anglers, while the unpredictability and fighting characteristics of rainbow trout make them the preferred species for anglers after a challenge. Of the many fishing techniques used at Maligne Lake, trolling a sinking flyline with a minnow pattern or dry casting chironomids (midges) are most popular with locals. Although most of the focus is on the better-known Maligne Lake, Medicine Lake has a healthy population of rainbow trout. One of the best ways to ensure a successful fishing trip is to hire a guide. At Maligne Lake, guided fishing trips are offered from the Boat House by Maligne Tours (780/852-3370, 8:30 a.m. to 6:30 p.m. daily June to Aug., www.malignelake.com). The half-day trip is $199 per person for two people and the full-day trip is $250 per person for two people. Currie’s Guiding (780/852-5650, www.curriesguiding.com) offers trips to Maligne Lake (full day $285 per person). Rates include equipment and instruction. Source for Sports (406 Patricia St., 780/852-3654) and On-line Sport & Tackle (600 Patricia St., 780/852-3630) sell and rent fishing tackle and also have canoe and boat rentals. Whether you fish with a guide or by yourself, you’ll need a national park fishing license ($10 per day, $35 per year), available from the park information center or On-line Sport & Tackle (600 Patricia St., 780/852-3630).